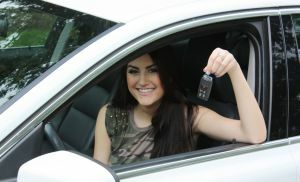 Once you have found the used car that you want, there are a couple of very important steps to closing the deal. 1. Never Take Delivery of a Used Car Without the Title! If somebody owns their car (no loan or lien) they should have the title, don't listen to excuses! If there is a loan or lien on the vehicle the lender holds the title. Do not pay in full until the title is in your hand. You might have to go to to the lender or lien holder and pay the balance in full. The seller may say something like "I'll have the title in a couple of days, after I cash your check." Don't fall for this. When completing the deal, the seller will sign the back of the title, fill out the mileage and the selling price. Some states now offer electronic titles. Of course, this opens up whole new avenues for scammers. If the car is titled electronically, you must check with the local DMV to find out how to verify the ownership and transfer the title in your location. Check the seller's ID and make sure that they are the current owner listed on the title. If they won't show ID, walk away. You have the right to verify who they are and that they actually own the car. No title. No deal! No sale! It's that simple! 2. Never Sign an "As Is" Paper at the Dealer. If you are buying from a dealership you should get at least a 30-90 day warranty. If they won't offer one pick another car or go somewhere else! If they give you an "As Is" paper to sign, get up and walk out. Verbal promises mean absolutely nothing. Buying a car "As Is" means they aren't responsible for anything that goes wrong. You will not have any legal protection if the car is a "lemon." If they tell you there is a warranty, get it in writing and make sure to read it. Everybody that Emails Me After Signing an "As Is" Paper Got Ripped Off! If you sign an "As Is" paper, the state attorney won't even give you the time of day and legally there is nothing you can do. Try contacting a local news station. Most markets have some type of consumer reporter at a TV station who loves to go on the attack. A TV station is your best option because negative publicity hits a dealer's bottom line. Here are the top mistakes made by buyers of used cars. Don't become a victim! The seller does not back up verbal promises in writing! 4. Don't Forget Sales Tax! Check out the used car sale laws and procedures of transferring title in your state. Next, fill out the back of the title to register the car in your name with the state. There is also a box to enter the selling price. People like to write in a much smaller amount for the car than they actually paid in an effort to avoid paying a high tax bill. I advise against this, your state is not stupid. Their systems tells them the blue book value of the car. If you paid $7,000 for a car then claimed you paid only $2,000, the computer flags down the Department of Revenue, and they'll send you a nasty letter stating that they know the car is worth $7,000. Time to pay up! Before you drive away make sure you have the title, a signed copy of the bill of sale and any maintenance records. Don't forget to ask if there is a special wheel lug key or you will not be able to change a tire. Make sure you have all sets of keys, owners manuals, repair manuals and spare parts that the seller may have. Be sure the car has its spare tire and jack. Make sure all brake lights and other lamps work. You don't want to get pulled over by the cops for no brake lights on your way home. Ask the seller if they have a car cover. You may want to have an oil change done. If you purchased the 25 report package from AutoCheck, re-run the report on the car you bought before your package expires. This will catch any last minute title issues that could have popped up days before you bought the car. In some states it can take over a month for their information to propagate to the AutoCheck databases. The seller could have rebuilt the title a week before you bought it so it might not show up in a title check for a month. CarBuyingTips.com has researched the best car warranty sites and found the ones that are known to pay claims. We recommend the unique compete model offered by CARCHEX. Make sure that you read our chapter on buying an Extended Warranty or you'll end up paying too much. It is especially important to protect yourself if you buy a 3 or 4 year old used car. This is the time frame where the manufacturer's warranty expires. Unless you buy an extended warranty, you are risking large repair expenses.